News: American manufacturer 3D Systems has unveiled the world's first 3D printers for food, printing out sweets at the Consumer Electronics Show in Las Vegas. The Chefjet and Chefjet Pro are the first professionally certified, kitchen-ready 3D food printers, on display at 3D System's stand at CES this week. The machines were launched with the pastry chef in mind, and so far they can print confectionary in milk chocolate or sugar in three flavours: mint, cherry and sour apple. "The machine uses an ink jet print head that's just like the one you would find in your desktop 2D printer," explained 3D Systems' Liz von Hasseln. "It spreads a very fine layer of sugar then paints water onto the surface of the sugar, and that water allows the sugar to recrystalise and harden to form these complex geometries." A "digital cookbook" will allow those unfamiliar with CAD modelling to generate and print complex objects with ease. The ChefJet is aimed at the domestic market and will retail at under $5000 (£3000). It produces single-colour edible prints for items like sugar cubes and cake decorations. The ChefJet Pro will be priced at under $10,000 (£6000) and produce full colour prints with a larger build volume. Both will be available in the second half of 2014. The launch by 3D systems grows out of its acquisition of The Sugar Lab, the 3D-printing cake decorating business founded by architecture graduate von Hasseln and her husband, Kyle von Hasseln. In 2011 the husband-and-wife team wanted to try and "print" a birthday cake so they hacked a 3D printer and, after much trial and error, successfully printed a mini cup cake with cursive sugar script. The couple, who both have backgrounds in molecular biology, then launched The Sugar Lab in July 2013 and it was acquired by 3D Systems in September 2013. 3D Systems' creative director Janne Kyttanen told Dezeen that the company was working on 3D printed food when we interviewed him for our Print Shift publication this time last year. 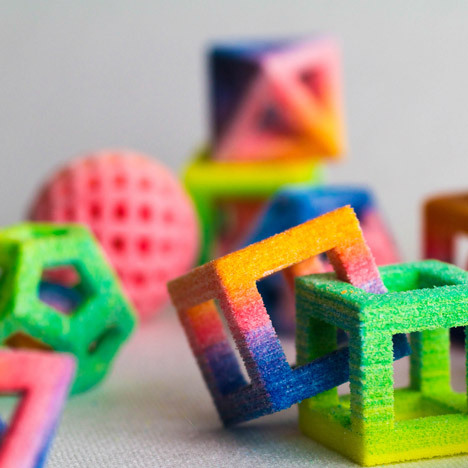 "Food is the next frontier of 3-D printing," he said. "We're already printing in chocolate, so a lot of these things will be possible in the next few years."